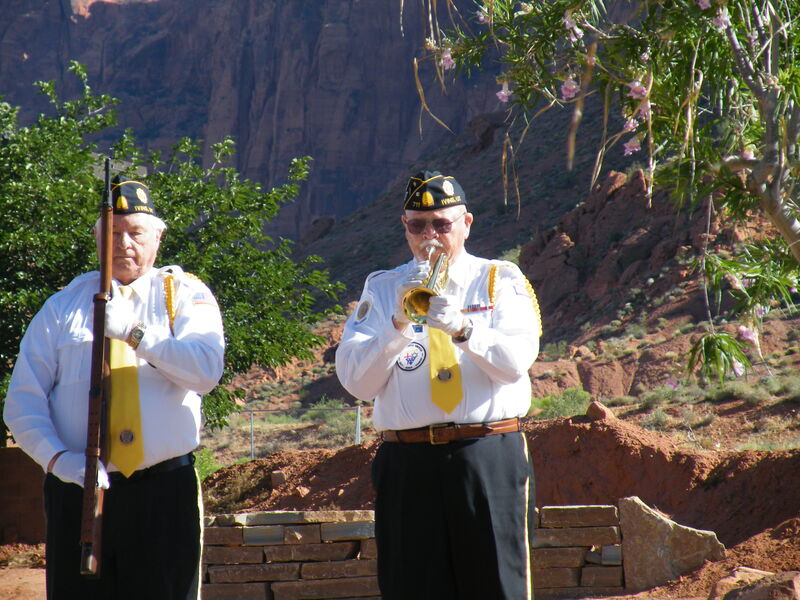 The local American Legion Post 90 conducted it. 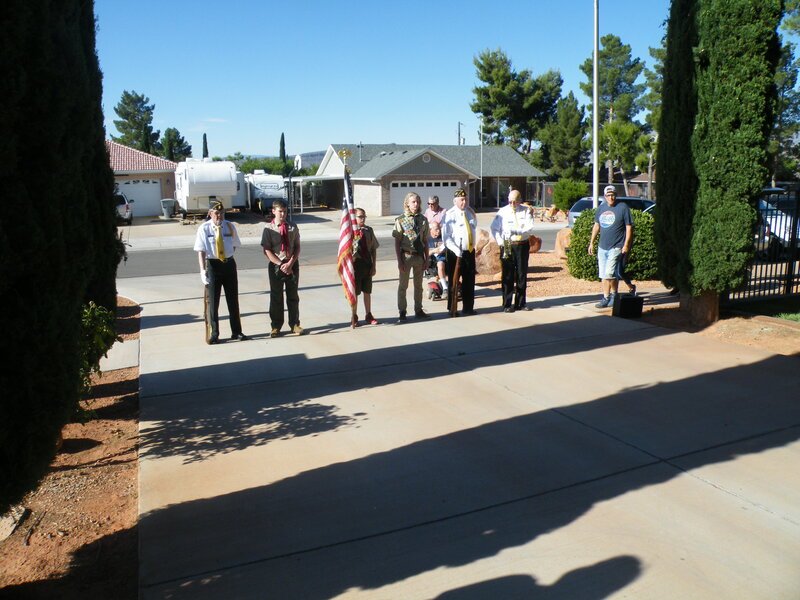 With help from a boy scout troop, they presented the colors. Anna Dee Packer widow of a veteran read the list of those buried in the cemetery who had served in the military. Among the list of deceased veterans of the armed forces of the United States of America were many who I had known, even two cousins. The 3 men from Post 90, Maynard Sorensen. 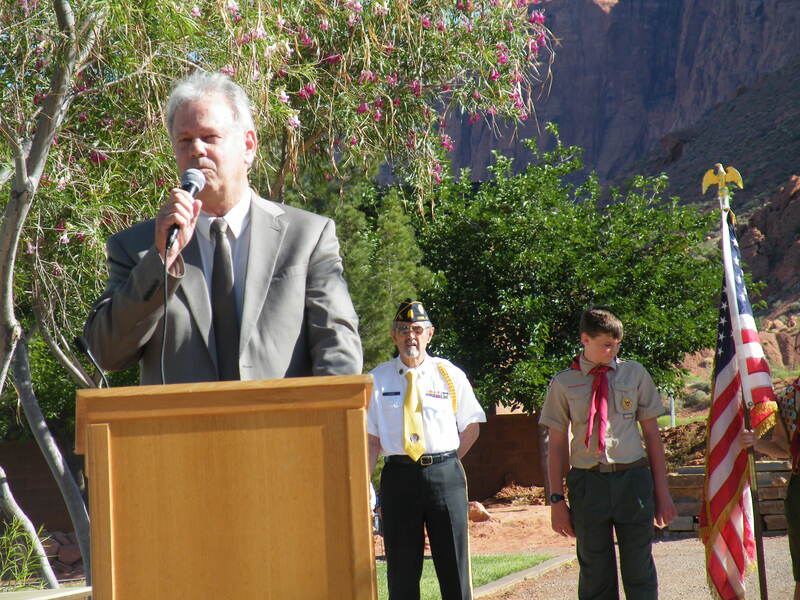 Dennis Hancey, Jim Flohr, and three Boy Scouts made up the Color Guard. The colors were presented, Hancey and Flohr fired the Springfield rifles in salute and Taps was played on the trumpet by Sorensen. After that the Hymn of the Coast Guard “Eternal Father Strong to Save” was sung by local tenor Robert Proffit. 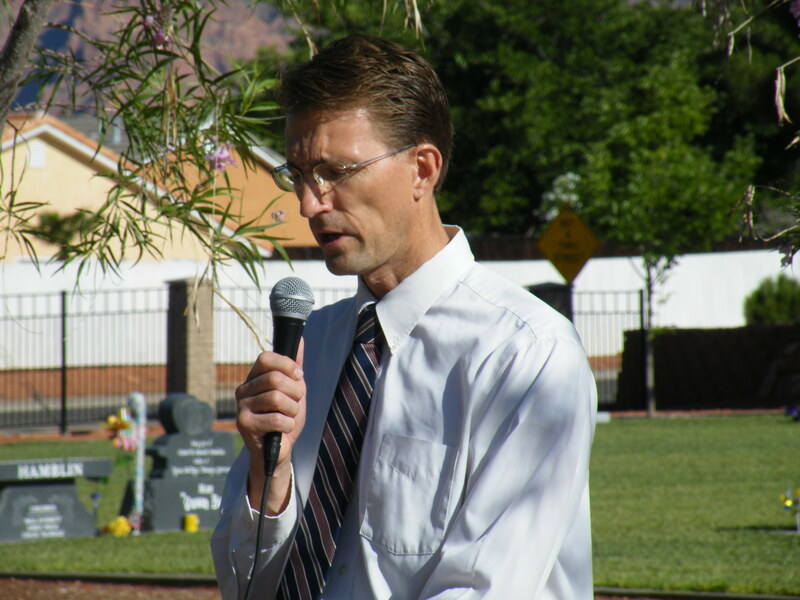 Then the Mayor of Ivins, Chris Hart delivered a stirring speech, even reading from the Constitution’s Bill of Rights as part of his remarks. A lot of people and flags. Later in the day I stopped by the Santa Clara town Cemetary to see their new Military Memorial as well as the rest of the cemetery. The pioneer part was decorated with a few flags and hundreds of yellow Desert Marigold (Baileya multiradiata). 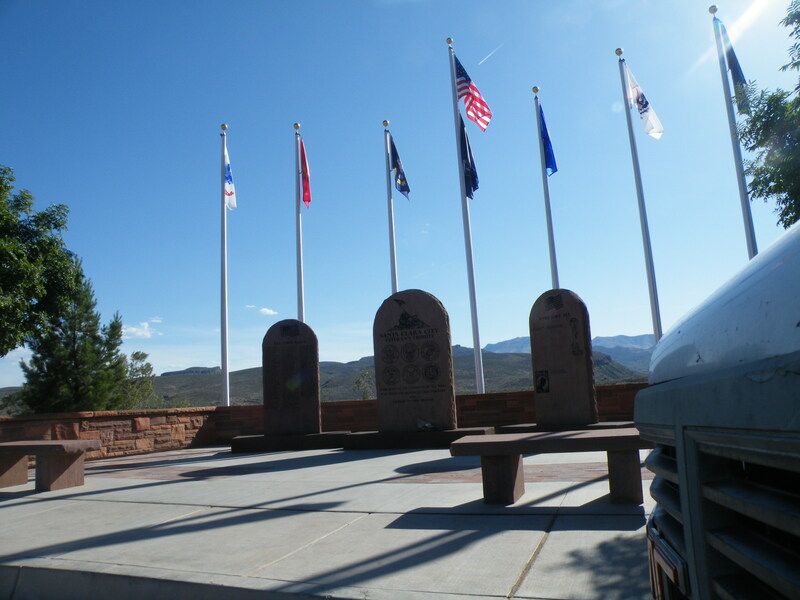 The sign on the monument for the departed military veterans said “All Gave Some” ”Some Gave All”. War seems such a waste. So many die. Just how many in the United States alone is told about in this article by Mike Huckabee. “People these days are awfully spoiled. We think we’re making a big sacrifice if our hotel room doesn’t have free wi-fi. But Memorial Day is about honoring the men and women of the US military who truly made the greatest of all sacrifices to secure our liberty. Memorial Day was born after the Civil War, when families would take a day to tend and decorate the graves of Confederate soldiers. It soon spread to the North, and became known as Decoration Day. Eventually, it became a national holiday to honor all American military veterans who gave up their homes, their families, their very lives — everything they had, or ever dreamed of having – and sacrificed it all for their country. And just how many have made the ultimate sacrifice? You might be stunned at the answer. From the Revolutionary War to the War of 1812, through the Civil War and Spanish American war, World Wars I and II, Korea, Vietnam, Iraq, Afghanistan, and all the other wars, police actions and rescue missions since 1776, over one million, three hundred and eight thousand Americans in uniform have laid down their lives for their country. Imagine if all those soldiers, sailors, Marines and airmen could come back to life for a parade in their honor. Picture them marching past in rows of ten, each row taking just 10 seconds to pass. That parade of fallen heroes would march on and on, row after row, hour after hour, 24 hours a day, for over 15 straight days! That is the enormity of the sacrifice that’s been made to preserve our freedom and security. And it doesn’t even include the millions more who gave their limbs, their sight, and the best years of their lives, all for us. These heroes laid down their lives for such American ideals as freedom, liberty, equality, democracy, fighting tyranny and defending the helpless; bedrock principles that they passed down to us. It is now our sacred duty to preserve them for future generations. 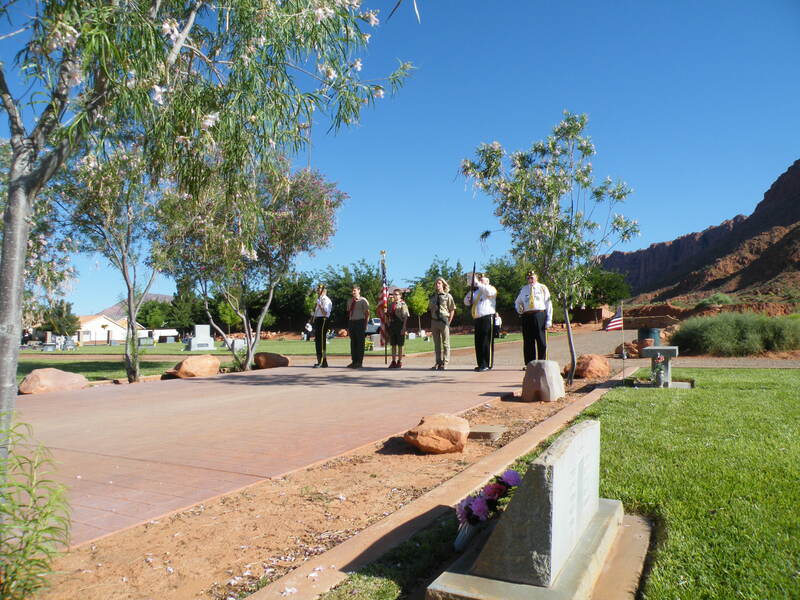 Today, as we fly our flags, attend parades, visit veterans’ hospitals and tend the graves of our loved ones, let’s stop to think of all the rows and rows of crosses in veterans’ cemeteries. Let’s be humbled to reflect that each and every cross marks the resting place of a genuine American hero. “To you, from failing hands, we throw the torch. Be yours, to hold it high. If you really want to memorialize these greatest of American heroes, then take up the torch they passed to us. Hold it high. And never let it drop! Why is it that so many feel they must defame great people? So I go to the link then to the read more link to get the article. 10 He was afraid to carry a knife: he struggled with crippling depression. What is wrong with this writer. 9. He jumped out of a window: in Congress to block a vote on an important issue. I wish more Congressmen would do more to prevent bad votes, or to support good ones for that matter. 8 He stopped his first political speech to fight someone. Wrestling was a big thing in the day. 7 He started a riot. Not really, just a street fight with some fighting for him and some against him. Physical fighting was a big deal to settle issues then. And young men often fight to prove things. 6 He watched his first love die. So what is so wrong about someone who must witness the passing of a loved one? 5 He was considered hideous. Do we all need to be beautiful as the world considers beauty? At least he could joke about it. That’s where I stopped reading. Rumors are started by waging tongues to destroy and truth is generally far from them. More rumors meant to defame and far from truth. 2 He nearly fought a duel..
use of the broadsword, the duel was averted to his credit. So it’s a crime to have doubts before you wed? Do they feel it makes them better? Everyone has flaws or parts of their lives that others think of as flaws.